Running marketing and social media campaigns has always been complex. While a social media manager’s job seems easy and straightforward, big agencies, media companies and brands often have complicated processes in place in order to keep their brand and feed consistent on social media and therefore run into issues with existing tools. For a while now, we’ve been hearing and collecting feedback from our users on how to ease some of that pain with Sked. We know your social media process isn’t just choosing a photo and posting it, very often several people are involved in providing the digital assets (freelance designers and photographers), writing out the copy, choosing the hashtags and positioning the post within a broader strategy (social media managers and strategists) and finally, approving posts to be published (clients, social media or marketing directors). Until now, your workflow might have looked like this: getting assets emailed, preparing them for publishing and adding to a spreadsheet (painful!) and then emailing back and forth with clients and directors until they’re happy with the outcome. The process is time and energy-consuming. Which is why we built new Collaboration workflows within Sked, to save you some time and help you move on from spreadsheets. 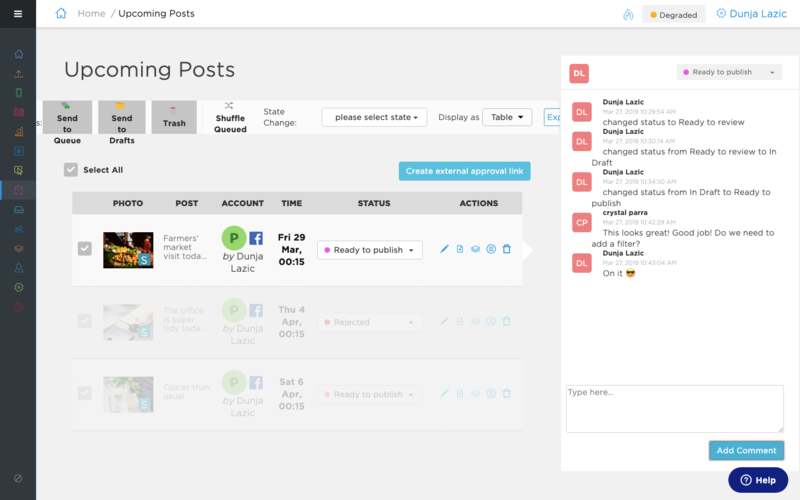 The new Collaboration tools, along with the Hashtag Recommender and Analytics, aims to make Sked a full-stack productivity tool for social media marketers and it is built exclusively thanks to feedback from 10,000+ Social media managers using Sked to make their lives a little easier every day. For starters, head over to your Billing/Profile settings and you’ll find Collaboration settings on your right. 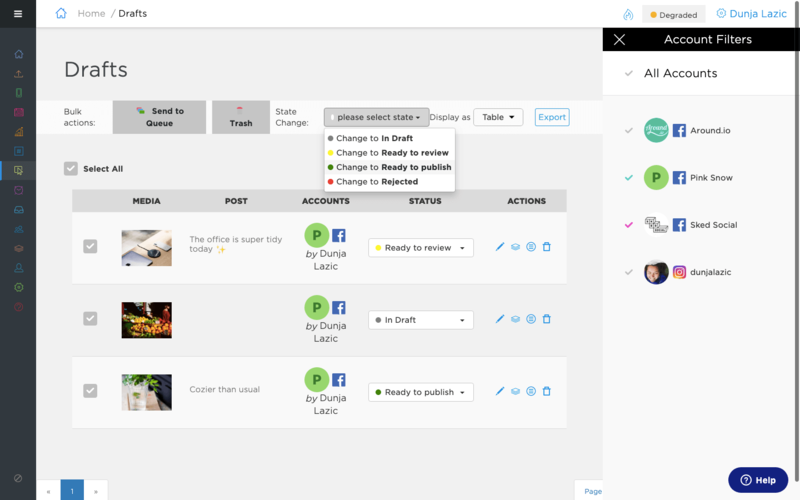 Here you can define your workflow, edit your approval labels and color-code them. Each state has a “If scheduled time reached” option with a checkbox. You can use this to indicate if a post in a given status should be published. For example, you probably don’t want a post that is in “Ready to review” to get published. 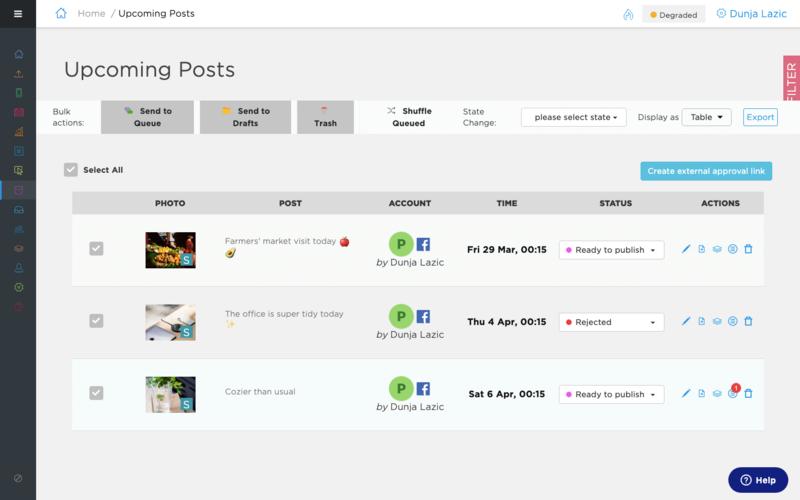 Other Sked users will be able to see Upcoming posts and their status based on their existing permissions (you can edit any access rights in Manage Users). I’m curious to see all the ways you’ll use Collaboration within Sked. The workflows we set up are pretty flexible in order to help us learn how to improve the tool and what to build next. 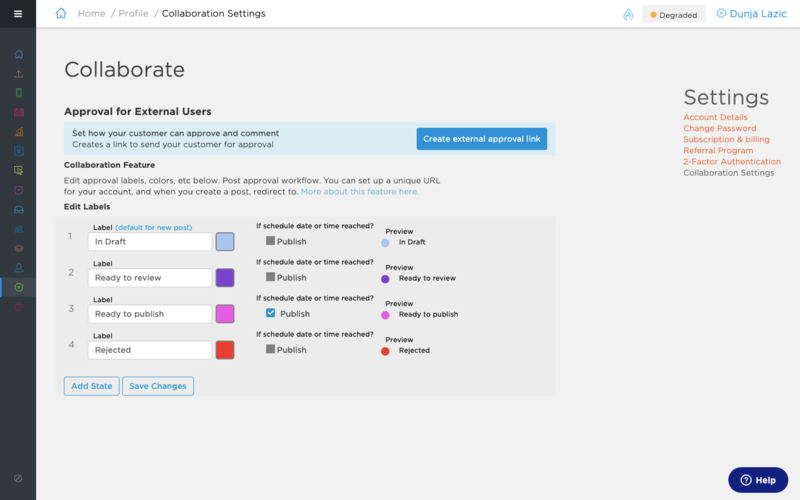 If you have any ideas or feedback after using Collaboration, be sure to let our Product team know about it – Sked is built and improved thanks to your feedback. 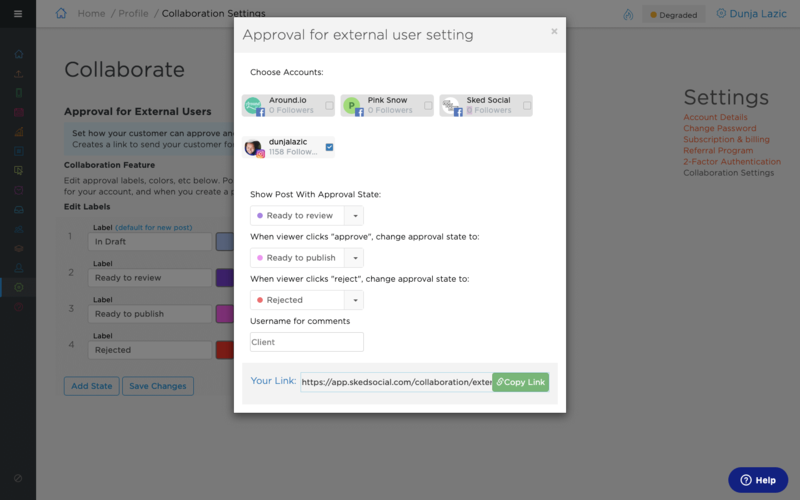 Collaboration tools are only available to our customer on the Agency & Enteprise plans. If you’re on one of these plans and would like to check out the new tools – email our support team and someone will be in touch shortly! You can learn more about how to use Collaboration tools here. We’re all eager to hear your feedback and see the ways Collaboration can improve your creative & approval processes.